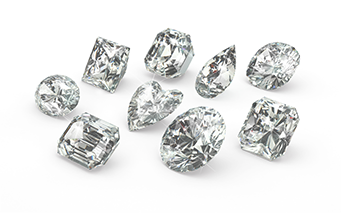 Virtually all diamond cuts sold for use in jewellery are one of a few round or fancy diamond shapes. 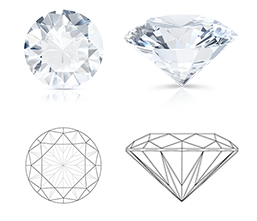 Choosing a diamond shape is usually the most difficult and most important factor to consider when picking a diamond. 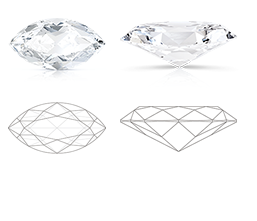 We’ve prepared a handy list of the most popular diamond shapes below, to help you select the perfect diamond. If you need further help, please contact us and we’ll be happy to assist you. This shape accounts for over 75% of all diamonds sold today. Round is the most popular shape used for an engagement ring, and of these the round brilliant cut is the most commonly chosen. It's 58 facet-cut achieves the maximum brilliance a diamond can have, maximising the reflection and refraction of light. 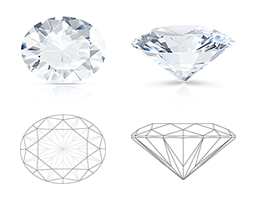 Diamonds cut in this way have more depth than width, and can therefore seem smaller than other finely cut diamonds, but they are the most brilliant of all shapes. This is one of the most popular fancy-shaped diamonds and is popular for engagement rings. The princess cut, invented around 30 years ago, is the most important new shape/cut since the perfection of the modern brilliant cut over 60 years ago. 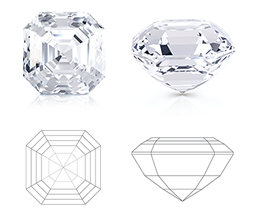 The princess cut is essentially a square version of the round brilliant cut, known technically as a square modified brilliant cut. It is a style of cutting that improves the faceting of square/rectangular stones to obtain maximum brilliance from the diamond, as well as making any inclusions/flaws in the stone less visible. This shape was originally developed for cutting emeralds, until it was discovered it was suitable for other stones. An emerald cut diamond can be extremely stunning. It may not have the sparkle of a round brilliant cut, but because of its long lines it tends to produce more dramatic flashes of light. It is more scintillating than brilliant, and highlights the clarity of the diamond. The emerald cut shape is rectangular with cut corners, and is one of the most elegant and sophisticated diamond shapes. 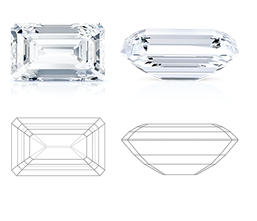 If you choose an emerald cut diamond, we recommend selecting a Clarity grade of VS2 or above. This shape is a cross between a princess and an emerald cut. It combines the best features of the round brilliant cut, the elegance and trimmed corners of an emerald cut and a squarer shape more similar to the princess cut. 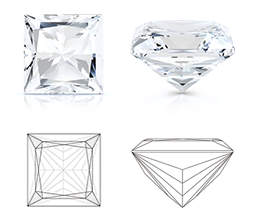 Radiants are similar to emerald cut stones in their shape, but the faceting is different making the diamond more brilliant. This cut has 70 facets to maximise the brilliance of the diamond. This shape was commissioned by Louis XIV in France, and was based on the smile of the Marquise de Pompadour. It is a variation of the round brilliant cut - elongated with pointed ends. A marquise diamond is beautiful when used as a solitaire or when enhanced by smaller diamonds. This shape can maximise carat-weight, making the diamond appear much larger, and tends to make your fingers appear long and slender. 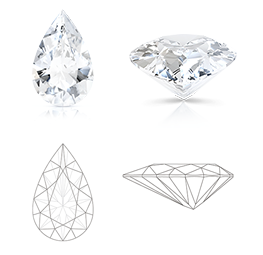 Pear shaped diamonds are often called 'teardrop' diamonds because of their shape. This shape is a combination of the round brilliant and the marquise, a fiery cut with elegant lines and lots of sparkle. Whilst not a traditional selection, pear shaped diamonds make beautiful engagement rings either as a solitaire (single stone) or as shoulder stones either side of a central stone. The asscher cut was developed by the Asscher Brothers in Holland in the early twentieth century. It is often referred to as the 'square emerald cut' - because it is square with wide step facets and cropped corners. This cut is designed to draw your eye into the stone, and whilst not a traditional selection, asscher cut diamonds are now very fashionable for engagement rings. 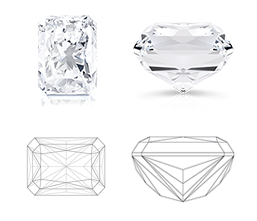 Like emerald cut stones, asscher cuts don't produce the same sparkle as most other shapes but produce flashes of light instead. The oval cut diamond is actually an elongated brilliant cut diamond. 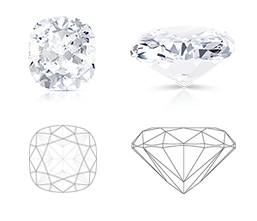 Oval diamonds can appear larger than round diamonds of a similar weight. This shape is ideal for elongating shorter fingers, like the marquise shape. Although the oval diamond is not as popular as a stand alone diamond in a solitaire engagement ring, it is very sought after in a three-stone diamond engagement ring. Because of its elongated shape and curvature, it is considered a very classical and elegant diamond. A square or rectangular shape with rounded corners, called 'cushion' as it resembles a pillow shape. A popular choice for vintage designs. Usually comprised of 58 facets, but not as brilliant as a round brilliant diamond. We tend to use square cushion cut stones as standard, but you can request a rectangular cushion shape if you prefer. 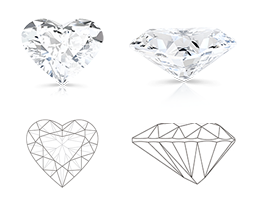 A heart shaped diamond is usually comprised of between 56 and 58 facets, and is considered one of the most romantic choices. Heart shaped stones can be quite fiery with excellent sparkle.